You know what it is I love about being Spider-Man? Everything! (SPOILERS) I didn’t have a whole lot of hope for the follow-up to Marc Webb’s 2012 Spidey reboot. The first one wasn’t actually terrible, but it was definitely a mess that bore the scars of a traumatic birth in the editing suite. It was also marred by only sporadically successful stylistic choices and some truly rotten design work (chiefly the villain). Add to that an unnecessary origin story with a botched “hero’s destiny” ladled on top to attempt to make it distinctive and it’s a surprise it worked at all. But The Amazing Spider-Man was blessed with a couple of great leads in Andrew Garfield and Emma Stone, and charisma goes a long way. There was word that Sony and the makers were well aware they had gone somewhat awry, and the sequel would pull out all the stops in an attempt to course-correct. Yet the trailers failed to convince. Gaudy, colourful and frenetic would be a nice way of putting it; a headache would be another. The finished film suffers from many of the issues of its predecessor, but also repairs a number. It’s biggest crime is overstuffing the cooking pot; it’s greatest asset is that Webb and cinematographer David Mindel are having a ball visualising Spidey’s world, at times out Raimi-ing Sam Raimi. Oh, and that Andrew Garfield is an absolutely perfect incarnation of the wisecracking webslinger persona. Seriously, it’s amazing that Maguire got away with slightly shy goofball Parker for so long. ASM2 will probably be unfavourably compared to this summer’s superhero darling Captain America: The Winter Soldier, and it’s certainly true this lacks the thematic depth that is Captain America’s greatest asset. But there’s a level of swings-and-roundabouts for what works and what doesn’t in both; The Winter Soldier isn’t the unalloyed perfection some have suggested. In terms of action, even though Webb rather goes overboard during the climax, ASM2 is much more impressive than Soldier’s sometimes in cohesive staging. There's the occasional dodgy moment, where his fondness for variable frame rates during the action results in a duff shot, but in the main his confidence is infectious. Both pictures suffer from not knowing when to stop, a malady typical not just of the modern superhero movie but the modern blockbuster generally. Fatigue has set in by the time we reach the big fight between Electro and Spidey, and there’s still the Green Goblin to come and the all-too-quickly-gotten-over demise of Gwen Stacey (Stone). Passages where ripe for expansion are skirted over (Harry Osborn being disinherited from Oscorp momentarily puts us on his side, and it would have been much more effective if everyone hadn’t been in a rush to turn him utterly evil). Spidey’s a homespun character, not intended to philosophise deeply over the meaning of the world and where the state of his country, so it doesn’t seem appropriate to complain about a lack of subtext in ASM2. Where he needs to deliver is in terms of heart and soul, and with Garfield in maximum charisma mode the movie has something going for it that Captain Bland wholly lacks. If The Winter Soldier is the more impressive movie overall, because ultimately it’s innovation outweighs the de rigueur side of the Marvel plotting, Spidey succeeds in its own way, despite suffering from déjà vu at crucial moments. It could have been a great movie if it just knew when to stop; shorter, punchier, more emphatic. There are individual set pieces here that are some of the best co-ordinated in the superhero genre thus far. But the picture goes so far beyond the point where the audience is on side that it’s easier to recall the water-treading fireworks of the last act rather than the giddiness and deftness of touch of the first two. The opening sequence finds Peter’s father (Scott Campbell) and mother Mary (Embeth Daviditz) attempting to leave on a jet plane, not knowing when they’ll be back again. After the tepid goings on of the first movie, Oscorp shenanigans that only succeeded in mildly irritating and skewing the notion that Peter is just and ordinary teenager blessed with a very special power (which brings great responsibility etc), it feels like the makers have grasped the mettle of his plot thread, for better or worse, and are running with it. It’s an invigorating, exciting scene, even if is perhaps an overt call back to the demise of Kirk’s pappy in the also Alex Kurtzman and Roberto Orci scripted Star Trek (also on the authorial credits are Jeff Pinker and James Vanderbilt). So it’s a shame that nearly every subsequent return to the subject of Peter Parker parents is hard work. All those shots of dad’s briefcase, Peter becoming obsessed with tracking down “Roosevelt” and creating a sprawling map on his wall during an overnight montage (well it seems like it), Aunt May (Sally Field giving it prestige value but little else) having to be told Peter isn’t rejecting her. Most awesomely stupid (The Awesomely Stupid Spider-Man?) is Peter’s eventual discovery of the truth of Roosevelt. He enters a disused subway station, puts some coins in the slot and a whole carriage ascends from beneath the tracks. I mean, what? Apart from being a really dumb attempt at a “Let’s do an impressive Bat Cave thing”, when did Pere Parker find time for this? How did no one notice? Why did he do it? And the whole effort (on the plane) to download what is revealed as a tape message seems like a terrible bother when he might have just placed same explanation in a safety deposit box. I wasn’t especially taken with the idea that the spider serum has the effect it does on Peter because dad incorporated his own DNA into the initial experiments. Besides the (almost) complete lack of random chance in attaining the super power, it provides a neat cop-out justification for him not helping Harry. But the use of Norman (Chris Cooper) and Harry Osborne (Dan DeHaan) wins points for beating out a different path, at least initially. Norman is dying, then dead (although we never see a corpse), from a genetic condition that renders him with a scaly green tinge and great gnarled (green) talons. Don’t forget, kids, if you’re deformed you’re also evil. Even if you didn’t start that way, being disfigured will inevitably turn you to the dark side, even over the course of a couple of hours. Norman never becomes the Green Goblin, but since Harry also has the condition it’s only a matter of time before he uses Oscorp facilities to search for a cure. One has to wonder why, given all the resources at his disposal, Norman didn’t take a similar chance to junior, particularly given the remarkable healing abilities of the survival suit. Why didn’t Norman just get in the damn thing, since Harry appears to be on the verge of death when he dons it? The scenes of Harry taking control of Oscorp, favouring Felicity Hardy (Felicity Jones, who will no doubt be doubling up as the Black Cat next time out), and then encountering a coup at the instigation of a deliciously rotten Colm Feore are some of the strongest in the movie. As with the picture generally, the need to accelerate Harry’s decrepitude means there’s no chance to savour this. No sooner has he been deposed than he is releasing Electro, and no sooner has he suffered the adverse effects of the spider formula than he is reborn as an insanely hell-bent Goblin. DeHaan’s a great actor, but the quartet of writers needed to spend more time giving him a truly memorable character; someone you enjoy watching as much as Garfield’s Parker but for opposite reasons. It goes without saying that DeHaan wipes the floor with the Grand High Franco incarnation of Harry from the Raimi trilogy, but if he’s to be the Sinister Six mastermind he needs beefing up as an antagonistic force. Of course, it’s Electro on main villain duties and I’m not sure if it’s a complement or not to say that Jamie Foxx’s character is more interesting as the villain than in the persona of uber-nerd Max Dillon. Transforming Max via an encounter with a tank of electric eels isn’t even a stupid idea the writers came up with (it comes from one of the cartoons). Somehow that’s even worse, since you cant even take the credit of having brains enough to use the good ones. Dillon’s dribbling inferiority complex and worship of Spider-Man is arguably over-played (inspired by Jerry Lewis’ Nutty Professor? ), but at the same time I enjoyed the willingness to go OTT and, well, cartoonish with the character. 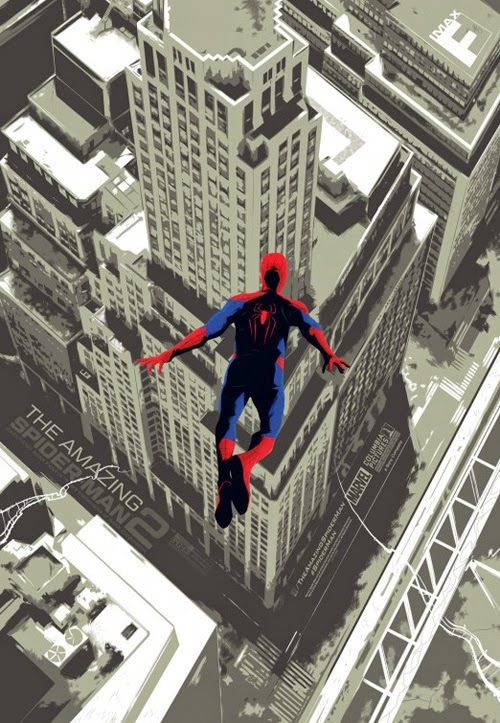 Particularly appealing is Hans Zimmer (in general this is one of his good scores, even if the main Spider-Man theme sounds uncomfortably similar to the one for ‘70s TV show Superstars) cutting loose and embracing the whacky for Max and the kinetic electric for Electro; indeed, his scoring of the initial set piece between Spidey and Electro is a perfect complement. This is the sound of a composer having fun, something I’d more associate with Jerry Goldsmith or (once upon a time) Danny Elfman. The problem is Max’s character is never quite there, never feels sufficiently distinctive with his one-note obsession with whether anyone remembers him or not. That could work, but perhaps needed someone to go even broader than Foxx manages. As Electro, his powers take on a Sandman ability to dissolve and reform; in terms of superpower if not personality (he quickly becomes second fiddle to Harry Osborne) he’s impressively positioned and rendered, even if floating about in a hoodie was obviously something that should have been nixed at the first production meeting. That said, the suit isn’t much improvement. For some reason Sony have completely ballsed up the villain designs in this iteration. Raimi stumbled with the Goblin, but got Octopus and Sandman just right. Curt Connors was a travesty, removing all the personality from the lizard design and even relieving him of his trademark lab coat. Whether or not Electro’s particularly whacky lightning bolt mask could have been transferred effectively to live action I don’t know, but what they do come up with is wholly lacking. It looks like a X-Men cast-off. That said, I was surprised Electro works as well as he does, because the advance materials suggested he’d be as middling as the Lizard. Perhaps less is more, since the best villains in the ASM2 are little more than cameos. It might have been better to have locked up Electro and left him there for The Sinister Six, particularly since the focus shifts to Harry (again, during the first two acts, Webb juggles the parallel plotlines with some skill; it makes it all the more disappointing that the movie lurches off the rails). Paul Giamatti, a barbed wire tattoo across his forehead and voicing an irresistibly uproarious, upbeat, Russian accent is a delight as Aleksei Sytsevich. This Rhino has no super strength, but he sports a super suit, in which he rampages come the climax (the mech over mutation choice recalls Willem Dafoe’s Green Goblin in the first Raimi film). The rhino bookend is, on paper, a nice touch, and the Spidey versus an exasperated villain aspect, besting him at every stage, has never worked better than during their first encounter. The final scene, where a bespectacled kid in a Spider-Man costume steps up to the plate, is the kind of sick-making “good New Yawkers get behind their hero” thing we saw in Spider-Man 2 (10 years ago, is it really so long?) It’s in keeping with a series that has very much stayed true to the idea of a hero who protects the innocent; there are numerous scenes in this movie where Webb’s superbly envisaged predictive spider-sense (like Downey Jr’s Sherlock Holmes but even more hyperbolic, if that’s possible) is used to save the lives of one or more bystanders. With all the criticism of the ultra-carnage of Man of Steel last year, no one will be able to level a similar accusation here. But with the kid thing, it really doesn’t need rubbing in that Spidey is a hero. It’s never a good idea to cut to crowds cheering a hero on; that’s what the movie audience is for. The good side is Garfield’s self-effacing bravado drags us unscathed to the end credits, but it really didn’t need to be there. The other great pleasure here is one of which I had no foreknowledge; Marton Csokas as the outrageously named and similarly outrageously accented Dr Kafka. If the spirit of Sam Raimi lives on in these movies it’s with Dr Kafka, but even Raimi never went this far into a broad comedy performance. The Doctor also derives from the comics, presiding over the Ravencroft Institute, albeit with a change of gender (Csokas was also in Noah, which I saw last week, but I can’t say he left an impression there). It probably says a lot that in a scene where Kafka is poking and prodding Electro, off the leash as a ghoulish parody-version of Dr Freud, you want to see more of him rather than his patient. He’s on the receiving end of an Electro lightning bolt, but I hope that doesn’t prove to be Kafka’s final end in this trilogy/quadrilogy. If it does, Csokas can sits comfortably in the knowledge he stole his scenes absolutely. The Amazing Spider-Man 2 isn’t as satisfying as any of the Raimi movies but, before you take that as a decisive negative, I’m a bit of fan of the flawed third instalment. Sure it doesn’t need Venom, but it gives us the wonderfully whacky emo Parker scene (surely the strongest indicator of whether the viewer is on the wavelength of its director). Where Webb’s take absolutely improves on Raimi’s is in the personification of its title character. I didn’t read a great many Marvel comics as a kid, but even I knew Spidey had a one-liner or quip for every occasion. Despite the portentous air of predestination the writers choose to bog Peter down with, this Spider-Man brings back the fun of the character. He’s not only witty verbally, but is quick with the sight gag, and this extends to the humorous staging of scenes. The side effect is it’s not always possible to juggle an essentially light-hearted character with the doom-laden backstory and sudden heartbreak this movie also fosters. It leaves it looking cynical and calculated in the final analysis (which, of course, it is; Sony wants to pump its slender franchise to the max). But there’s some great material in here; the whole of Spidey’s back-and-forth with Aleksei, the “Lick my hand” before flattening Max’s slap-down hair, sporting a fireman’s helmet while hosing down Electro, allowing Gwen to escape Oscorp through some expertly judged clumsiness as Peter entangles himself with security. There are times, such as when Peter is comforting his aunt, when you wonder if Garfield might be too accomplished an actor for this part, but there’s no doubting he absolutely has the comic chops. Full marks too for limiting the mask-less Spidey screen time in this movie. That hang-up of needing to see the actor’s face (to justify the fee?) has been evident ever since Batman Returns, but ASM2 only goes there when it is absolutely on-point; the death of Gwen Stacey. While the editing of this sequence is about as perfect as you could hope for, by this point the barrage of effects and fights has been so relentless there’s no chance to let the moment breath. There is some reasonable groundwork as a foreshadowing to the tragedy. Perhaps answering critics who found Peter’s betrayal of his promise to George Stacy (Dennis Leary) too much and utterly lacking contrition or moral compass, he is haunted by a vision of Gwen’s dad, leading to a break-up with her. This element is effective, even if you just know something bad will happen when he finally allows Gwen to get involved. Stone and Garfield make a great screen couple, full of zip and sparkle and genuineness when they split then get back together. Their relationship was easily the best part of the first movie, and it’s a compliment that it is only one of a number of great elements here. That is, until her death. Which ends up just another part of the extended melee of the finale. An episode that had such impact in its original form shouldn’t have been dealt with here with such graceless urgency, particularly given how the zest between the screen Peter and Gwen. There’s nothing wrong with the execution (so to speak; as per the comics, it’s the fall/web-slinging halt of the fall that kills her) but it’s just one of many targets the makers want to hit on their way to setting the scene for 3. Since they’re not ultimately the focus of the movie, her demise inevitably gets short shrift. Peter experiences a mourning montage, gets over Gwen and bounces back into action like nothing ever happened. Spider-Man probably isn’t the superhero movie you want to see end on a downer, but it could have been handled better than this. But hurry onto the next thing. The Amazing Spider-Man 3. Garfield ain’t getting any younger, you know. And the villains will be? Goblin, Rhino, Lizard, Electro for starters. Dr Fear is the mysterious man who visits Curt Connors at the end of the first movie and Harry here, but I don’t know that he amounts to a super villain. Dr Octopus? The Vulture? (We see a couple of suits.) Alistair Smythe (B.J. Novak), who in the comics invents the Spider-Slayers? The Black Cat, before switching sides? If the first half of AS2 is the template, rather than the extended climax, Webb could be onto something good, but the tendency for a grab bag of villains to devolve into a torrent of special effects may prove irresistible. The X-Men: Days of Future Past mid-credits clip threw me for a moment, I have to admit. Not because I thought for Sony and Fox might be intending to combine powers but because I couldn’t conceive of a reason why one studio would promote a competitor’s movie. Even the stated reason (Webb owed Fox a picture, so this was gratis compensation) seems a bit weak. That scene, and the recent trailer, looks quite decent, so perhaps both the tired franchise entries this summer will have a bit of juice to them (whether the accusations against Days’ director impact its box office remains to be seen). The Amazing Spider-Man 2 suffers from many of the over-cooked formula problems as Spider-Man 3, but there’s too much to enjoy in both entries to dismiss them out of hand. This wont be taking the superhero movie of the summer crown from The Winter Soldier (and even if it’s good, I cant see Days of Future Past being great), and that’s absolutely correct, but it doesn’t deserve to become a kicking ball for the things it gets wrong. Maybe Webb should have ended the picture when Gwen leaves for London. What’s worse? No third act, or a third act so over-extended you lose touch with how great the movie was prior to that point?